One of my favorite grains of all times, is short grain brown rice. I’m not sure when I actually discovered the short grain version of brown rice, but that was a good day. It’s superior to the long grain version for one reason. You know I’m big on texture, and this is about as good as it gets. Of course, if you’re not into chew, long grain rice will work just fine. 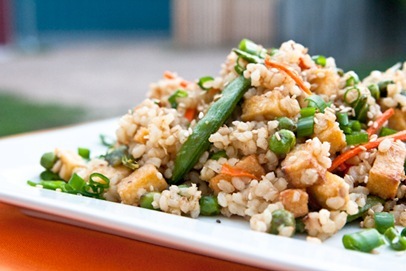 With this major addiction to rice, why is it…no, HOW is it that I’ve never made veggie fried rice? 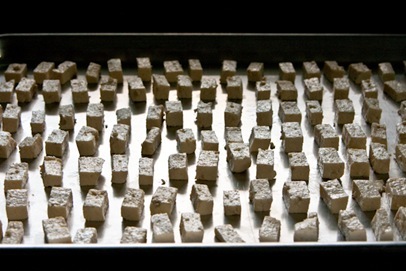 Let’s talk about how I cut one block of tofu into 128 pieces. 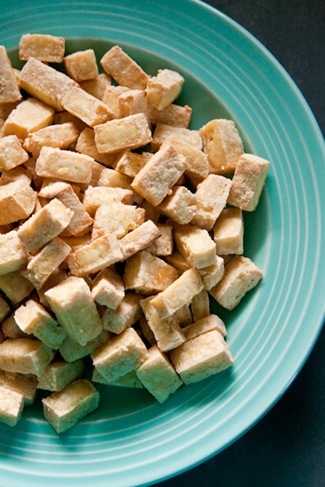 Because cutting them into 128 pieces, resulted in perfectly crispy on the outside, soft on the inside, bites of tofu bliss. Cutting them into 64 pieces is good, but 128 pieces, is better. I was able to turn them without burning my fingers off, and it only took about 2min to do so. Tossing them with a light coat of oil, ensures they won’t stick to the pan. No parchment needed. 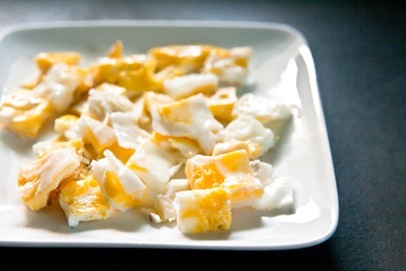 In my opinion, egg is a crucial part to fried rice, but I realize it’s not for everyone. Cooking eggs into the rice [as I describe in the directions] is my preference. However, you can also scramble the eggs or use the pour, poke + spread method, and let your guests decide if they want egg or not. And how exactly do you “fry” rice? After it’s done cooking, you add it to a pan with a little oil and fry it up for about 5-7min. That step, along with the crazy tofu cutting, is completely worth your time. The one thing I don’t like about fried rice, is that it always comes as a side. Well, today it turned into a full meal. In a large pot, add 1T oil over medium heat. 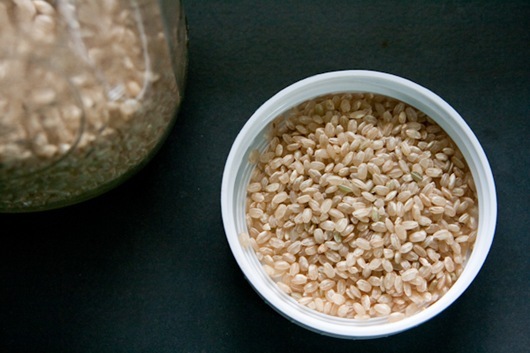 Once heated, add brown rice and brown for 5-7min, stirring a few times, until just starting to brown. Add 4c of water, bring to a boil, stir once, reduce heat to simmer + cover for 50min. DO NOT stir or uncover while cooking. After 50min, take the rice off the burner [still covered!] and let sit for 10min, then fluff with a fork. While the rice is cooking, cut + press the tofu into 8 equal slices, if using. Press for 30min. Reduce heat to med-low, add ginger, garlic, + carrots, stir for 1-2min and empty into a large bowl. Turn oven on to the high broil setting. Slice each of the 8 slabs of tofu, into 16 equal pieces. Toss with 1.5-2T oil in a bowl, gently, and spread on a large baking sheet. Broil for 5-10min, until golden brown and crunchy on top. Flip each piece, and broil again for about 3-5min, until golden brown. Move to a plate to let cool. In the same pan that you cooked the veggies in, add 1T oil and heat over medium. Add the rice, tamari [or soy sauce], 1.5T water and vinegar. Let cook for about 5-7min. If cooking eggs, whisk 2 in a bowl. 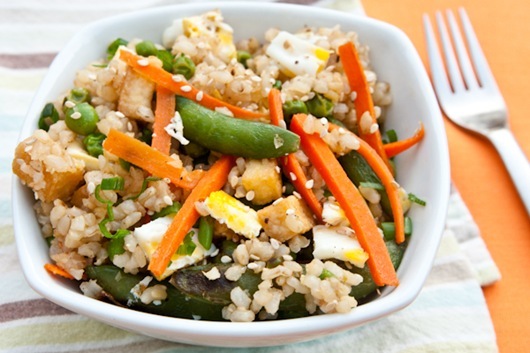 Create a well in the middle of the rice and add the egg in, cooking until done, then mixing in with the rice. 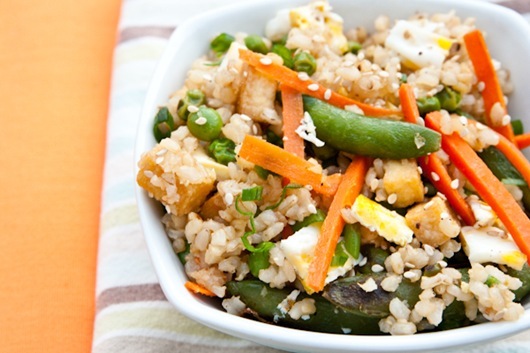 Add the rice mixture and tofu to the bowl of vegetables. Stir in the sesame oil and mix until combined. 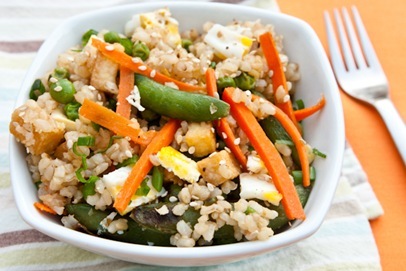 [do not add sesame oil to the hot pan, as it is not safe for high heat] Taste and add more soy sauce if necessary. 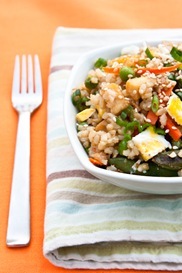 Top with chopped green onions, sesame seeds, and hot sauce if desired. *If someone doesn’t like egg that you’re cooking for, you can always cook the egg in a separate pan, then add to individual servings. 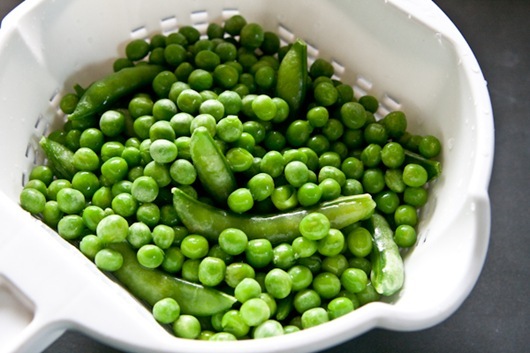 *If using frozen veggies, make sure they are completely thawed before cooking.